“Although we celebrate how this makes us different from the typical technology company, we understand that it benefits the company and our collective future to further invest in women,” said Hutchisson. “Senior leadership can empower, and be a real positive force in engaging employees and giving voice to diversity,” she added. CR MAGAZINE: HOW DID BLACKBAUD’S SENIOR WOMEN LEADERSHIP COUNCIL COME ABOUT, AND WHAT WAS YOUR ROLE IN ITS CREATION? 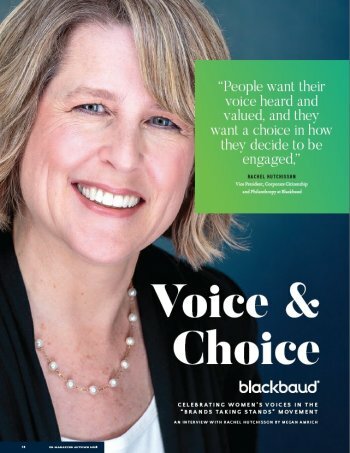 RACHEL HUTCHISSON: Three years ago, under the leadership of Catherine LaCour (Blackbaud’s CMO) and Mary Beth Westmoreland (Blackbaud’s CTO), we launched the Blackbaud Women’s Executive Summit, an event that brought together all the female members of Blackbaud’s Global Management Team. Earlier this year, Catherine and Mary Beth – in collaboration with our CEO, Mike Gianoni – launched the Senior Women’s Leadership Council to further expand our commitment to the women’s leadership community and as an investment in the future success of the company. Catherine, Mary Beth, and Mike asked me to chair the Council, and I worked with them and the Executive Leadership Team to identify nine women leaders to join me in this work. These leaders are all deeply respected in their own right, are personally committed to developing others, and represent an array of different functions and areas of expertise across the company. CR MAGAZINE: WHAT ARE SOME OF THE INITIATIVES THE COUNCIL HAS FOCUSED ON SO FAR? WHAT'S NEXT? RACHEL HUTCHISSON: We began with developing a strong women’s leadership community within the company, which is different from simply having excellent women leaders. To do this, we first spent time getting to know each other better, focusing on trust and support and creating space for true feedback and growth. As a first initiative, we collaborated on developing our “charge,” which focuses a great deal on how we show up every day as leaders, modeling excellence, how we develop others and advance them in the talent pipeline. The Council is now serving as the steering committee for November’s Women’s Executive Summit. We have a goal of having many voices heard at the Summit so the 65 women of the Global Management Team can build strong connections and truly understand both how each one of us is unique and how we can best work together to drive the company forward. The Council is also working with HR to preview and champion Respect at Work training and to assist from where we are within the company with diversity initiatives in talent acquisition. We are also encouraging members to get involved with Blackbaud’s affinity groups, which are employee led but can always benefit from sharing of expertise. These affinity groups include Women in Sales, Women in Tech, African Americans, LGBTQ, and employees with disabilities). CR MAGAZINE: HOW DOES THE COUNCIL BENEFIT BLACKBAUD EMPLOYEES AS A WHOLE? RACHEL HUTCHISSON: The announcement of the Council was an important moment for Blackbaud and its employees overall as it was a public recognition of the importance of investing in women leaders. It also helped to raise the profile of the members of the group as key contacts for others in the company and as an aspirational path for others. Although the Council is initially focused on building a strong community of the women in the Global Management Team, we understand and value the need for partnership with all leaders across the company. We also expect to come out of the Summit with key areas of interest that groups of leaders would like to take on, along with their male counterparts and other employees. In the end, we are seeking not only to help build women leaders, we are seeking to continually enhance our culture and to help Blackbaud be the best it can be. As we move forward, deepening our community connections, we will be equipping our women leaders to carry the message and leadership models forward within their own teams, so that we ultimately reach across the entire employee base. That’s a collaborative effort that involves everyone, and we’re in it for the long haul.